There is growing demand for a standardized and economical LIMS (Laboratory Information Management System) architecture in the life sciences industry due to global R&D operations, lack of budgets, stringency of regulatory bodies towards data integrity, and the need for compatible platforms for sharing knowledge/data within the organization and third parties (contract research and manufacturing organizations (CROs and CMOs)). Different companies have adopted different strategies to mitigate their respective challenges in the field of laboratory data management. SAAS based or In-the-cloud LIMS offers a standardized way to help commercial and academic institutions in managing their laboratory data across the globe. Lack of investment in hardware and a high degree of scalability makes Software as a Service-based (SAAS) architecture to be among the most efficient platform to implement global and standardized LIMS. We analyze the Total Cost of Ownership (TCO) of the SAAS- based or ‘In-the-cloud’ LIMS to understand its applicability as a standardized and cost effective solution to the current laboratory data management challenges faced by the life sciences industry. IT infrastructure plays a crucial role in the success of any organization. Across industries, companies use various types of IT enablers to manage their data. LIMS is one of the most widely used IT platforms in various laboratories across industries. LIMS is used to manage laboratory data generated from different laboratory functions including, but not limited to, sample testing, instrument usage, automation, and report generation. As per industry estimates, LIMS market is valued at around $1 billion in 2015 and is expected to grow at an estimate CAGR of 8 percent until 2019. Increased and continuous inflow of data from clinical and medical laboratories across the globe. Advancements in the area of proteomics and genomics and the inclination of the pharmaceutical industry towards personalized medicine and rare disease treatments. Adoption of big data and growing demand for better data mining techniques. Developing markets – India, China, and Eastern Europe; are pressing hard for automation, hence creating increased demand for LIMS. On the contrary, the life sciences industry is facing new challenges in managing laboratory data. Firstly, Global R&D operations of pharmaceutical companies – which include their captive sites and different research (CROs) and manufacturing (CMOs) partners, require LIMS to deliver a suitable platform for sharing, collection, storage and retrieval in compatible format across the functions of different laboratories. Secondly, downturn in economies has reduced financial resources for pharmaceutical companies. With these limitations, laboratories would shift their data management to a global and standardized architecture. Given this scenario, In-the-cloud LIMS could offer a standardized global architecture with optimum cost benefits. 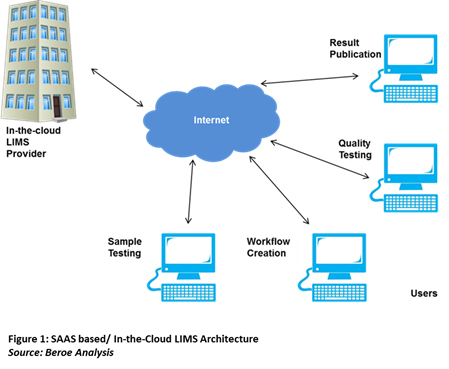 In-the-cloud LIMS is an SAAS-based IT platform to manage laboratory data generated from different laboratory functions such as sample testing, instrument usage, automation, and report generation (Figure 1). SAAS is an on-demand software delivery model where users subscribe the software and access it through a web browser. The provider hosts the software centrally and offers it to the user on the pay-for-use basis1. Vendors deliver LIMS in various forms based on a user’s requirement. Based on delivery mode, LIMS can be categorized into four types: Purchased Commercial LIMS, Rented Commercial LIMS, Hosted LIMS, and In-the-cloud LIMS. Each type is different in terms of their architecture, deployment method, and requirement for hardware and software support2. This eventually impacts the cost of the LIMS. The supply market of SAAS based LIMS is less crowded as compared to the other types of LIMS. According to Beroe’s findings, around 300+ LIMS vendors are present in the market with greater than 15 percent offering cloud-based LIMS. Table 1 below lists the differences among different types of LIMS. Are the cost savings sustainable in the long run? Who will be paying for software maintenance? What are the expected cost savings in the long run with In-the-cloud LIMS? Based on our understanding, the usage period of LIMS software in an organization is around eight to 10 years. To get more clarity on the cost benefits of In-the-cloud LIMS in the long run, we compared its cost with that of purchased LIMS for 10 years of usage. We arrived at the cost analysis as shown in Table 2 below. In the above analysis, the maintenance cost of purchased commercial LIMS during the first year is not included as it is free for buyers. For the subsequent years, the annual maintenance cost is around 20 percent of the initial license cost. For better understanding of the difference in total cost of ownership, we assume the yearly subscription fees of SaaS-based LIMS is as high as ~25 percent of the initial purchased cost of the commercial LIMS. According to the above analysis, for company ‘A,’ we assume that the one time license cost of the commercial LIMS is $50,000. Due to best-in-class maintenance practices, the annual maintenance cost is around 15 percent of the license cost i.e. $7,500. Then the total cost of purchase after 10 years is $117,500. Now, if company ‘B’ purchases the yearly subscription of SaaS-based LIMS at $12,500, then the total cost of purchasing SaaS-based LIMS for 10 years is $125,000. This would reap a loss of around $7,500 to company ‘B’ during 10 years. However, in case the usage is eight years, there are possibilities for company ‘B’ to get the benefits of direct cost savings due to the absence of hardware, operating system, and database costs. Also, the risk for company ‘B’ is reduced as upfront investment is less in comparison to the purchased LIMS and switching to other suppliers in case of any constraint. The total cost of ownership analysis goes beyond the purchase cost and must include the money and efforts spent on managing internal IT infrastructure. In that case, we would find the real benefits of SaaS-based LIMS. Table 3 below shows the hidden costs of a purchased commercial LIMS. Note: Maintenance hours and charges are subject to many factors such as location and the complexity of issue. When including the IT infrastructure maintenance cost with the initial cost, the equation changes dramatically in support of cloud-based LIMS. If we include the internal IT infrastructure cost to the analysis of the purchase carried out by companies ‘A’ and ‘B’, then company ‘B’ would earn cost benefits of more than $50,000 over 10 years. 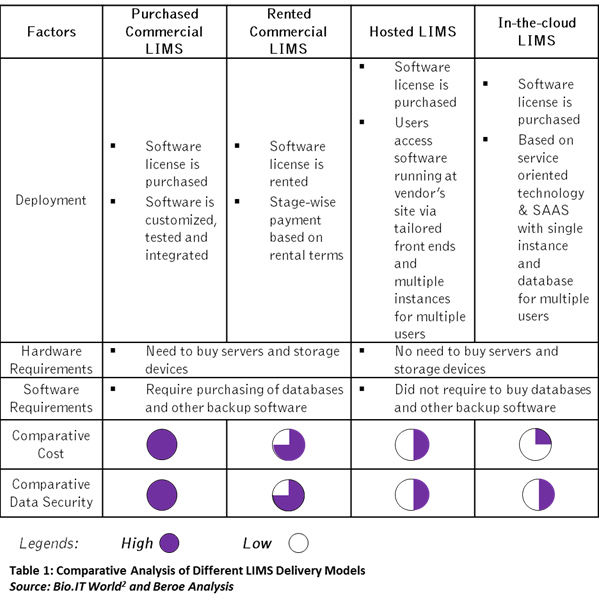 Based on the analysis presented in table 2 and 3, it can be concluded that In-the-Cloud LIMS offers an economical and standardized solution to the laboratory data management needs of big pharma as well as small laboratories of CROs, CMOs, and academia in both developed and developing regions. The purchased commercial LIMS requires more personnel assistance and monetary support for maintenance and other functions such as backup, storage, and recovery as compared to SAAS-based LIMS. Harmonization with the existing systems and data security are the main concerns restraining the users from adopting SAAS-based LIMS. In the near future, these concerns would be mitigated with increased adoption of SAAS-based LIMS as a result of advancement in technology. 8/16/96 Channel Washer - What`s the difference?